Why did a Russian provincial theater stage a version of Aldous Huxley’s dystopian novel? An artist of the Voronezh Chamber Theater plays The Chief, a violent leader of a tribe living in a post-apocalyptic world. While most regional theaters in Russia cling to traditions and go with old-school classical fare – Pushkin, Ostrovsky, Chekhov and so on – in the city of Voronezh, with the help of Territory International Festival School, choreographer Konstantin Keihel staged a theatrical version of an ecological dystopia by Aldous Huxley – using dance in a successful world first. Best known for his 1932 novel Brave New World, which portrays the senseless future of satiated,drug-sedated humans, British writer and visionary Aldous Huxley (1894–1963) wasn’t done with dystopias after writing his No. 1 hit. In 1948, after the horrors of WWII, he published another, little known and even scarier novel, Ape and Essence. Set in a post-apocalyptic future, where “nuclear and chemical weapons found their aims”, Ape and Essenceembraces the whole experience of the human race and comes to an unpromising conclusion: with the combination of technical progress and nationalism, we are determined to destroy ourselves. Perhaps too dark to become a success, Ape and Essence was only ever adapted for the screen once - by the BBC in the UK in an episode of ‘The Wednesday Play’ series that aired in 1966 – but in Sept. 2018, Russian choreographer Konstantin Keihel made a post-modern dance show out of it in the provincial city of Voronezh (320 miles south of Moscow). Why? Keihel works as a choreographer mostly in the famous Mariinsky Theater in St. Petersburg; he was brought to Voronezh under the “Art Laboratories” project, sponsored by the “Territory” Festival School and SIBUR petrochemicals company. 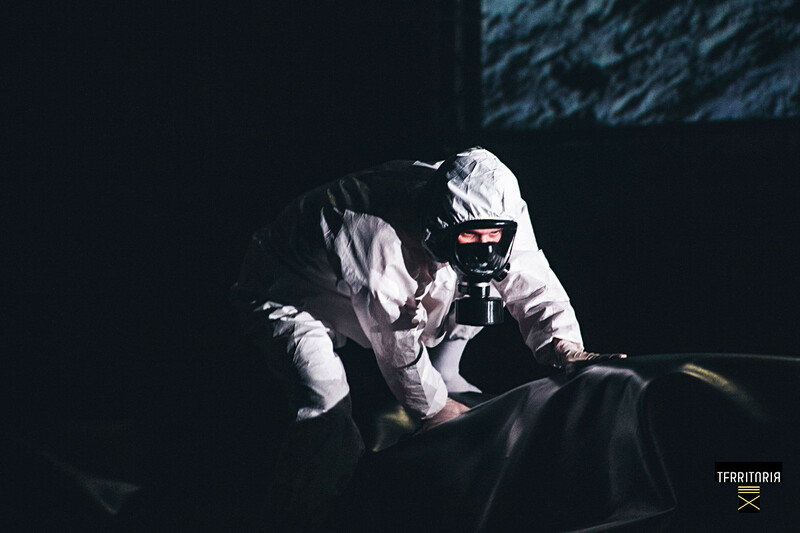 The project connects local theaters and artists with directors and choreographers from Russia’s cultural centers (mainly Moscow and St. Petersburg). For the young artists of the Voronezh Chamber Theater troupe, it was a great opportunity to work with an experienced choreographer, while Keihel and the composer he worked with - Konstantin Chistyakov - managed to create something really new and experimental in a region better known for staging classics – a play based on Huxley’s novel, which they renamed Silent Spring. “We didn’t try to put Huxley on stage word by word, that would be impossible,” explains Keihel. “This book, Ape and Essence, has so many layers that it’s obviously bigger than any play”. At the same time, he updated the 1948 novel, adding references to the ecological crises, space exploration and other issues of the 21st century. “After all, this play is about how industry affects ecology”, adds the choreographer. In Russia, like elsewhere in the world, these issues are pressing. Russia ranks 4th in the list of countries in terms of carbon dioxide emissions, and, as ecologists say, faces the dire consequences of global warming. In an almost wordless play, where feelings and events are reflected through dance, Keihel and Chistyakov mix lots of styles – contemporary dance music, jazz and other genres – and use much additional material, including cinema quotations on screens and remarks from the BBC’s televised play. Through all of this, the authors create a very dark world, where beauty, love and humor exist, yet are doomed to death. Keihel’s interpretation is even more pessimistic than the novel itself: the main heroes - a loving couple - die, killed by the ruthless tribe of post-apocalyptic half-people half-apes, degraded and crippled by the ecological consequences of World War Three. Responding to the question whether art can ever change the world for better, making people think of the consequences of what they are doing, composer Konstantin Chistyakov says that he doesn’t believe so. “Art works as an amplifier, through images and impression it can push a person towards something – but only if this person already was ready for it, was thinking of it,” said Chistyakov. Yet both he and Keihel emphasize that art is important per se, no matter if it’s able to make changes. The Voronezh audience seemed to agree, giving Silent Spring a standing ovation on the day of premiere, when the play was over and artists made a curtain call wearing Charles Darwin masks that symbolized the deadlock of human evolution. Huxley would probably have loved that. Of course, Voronezh is far from being the only regional city in Russia where theater thrives. Here's our list of provincial stages in our country definitely worth visiting.